(a) Stop the windshield wiper motor assy at the automatic stop position. (b) Remove the nut and the FR wiper arm & blade assy LH. (a) Remove the nut and the FR wiper arm & blade assy RH. (b) Remove the 2 clips. (c) Disengage the 9 claws, and remove the cowl top ventilator louver sub-assy. (c) Remove the windshield wiper motor & link assy by disengaging the pin as shown in the illustration. (b) Using a torx) socket wrench, remove the 2 bolts and the windshield wiper motor assy. (a) Apply MP grease to the clank arm pivot of the windshield wiper motor assy. (b) Using a torx) socket wrench, install the windshield wiper motor assy with the 2 bolts. (a) Temporarily install the windshield wiper & Link assy by engaging the pin. (b) Install the windshield wiper motor & link assy with the 2 bolts. 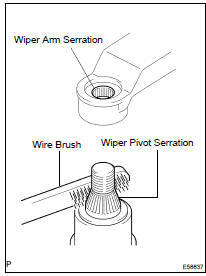 (b) Scrape off the serration part of the wiper arm with a round file or equivalent. (d) Install the front wiper arm & blade assy RH with the nut to the position shown in the illustration. (a) Scrape off the serration part of the wiper arm with a round file or equivalent. (c) Install the front wiper arm & blade assy LH with the 2 nuts to the position shown in the illustration.